According to The Onion a new study has found evidence that it is nice having friends. 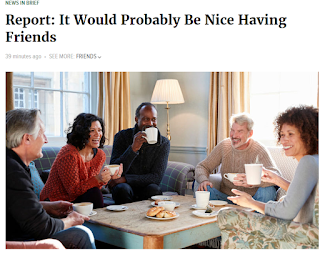 The study concluded that "friends help people feel less lonely." Ashley said, "I have found the study findings to be true in my own life. As a kid growing up, people didn't like me. I didn't have any friends. That's why I started going to church. I found out at church people are supposed to like you even if they don't. It's perfect for me."